I sat alone on the hotel steps, backpack, lunch, and fly rod by my side, hoping my guide wasn’t going to stand me up. 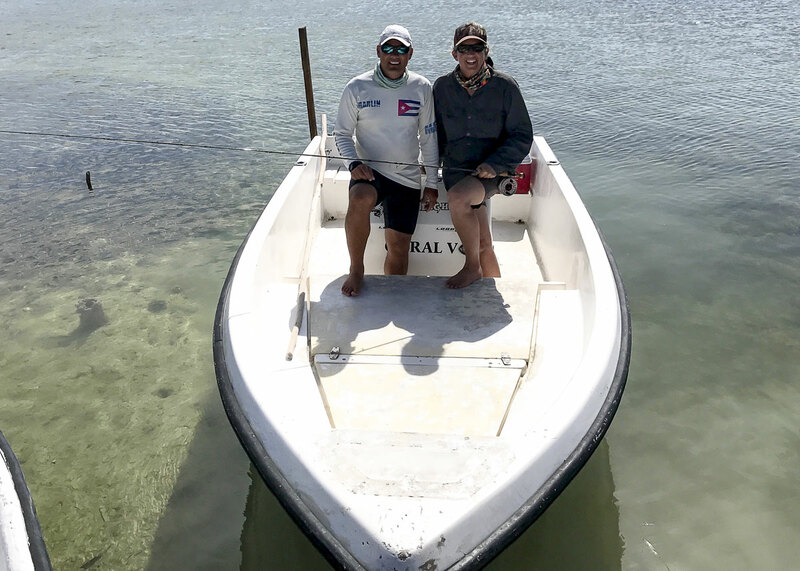 For the first time in my life I had the chance to see, if not catch, a Caribbean Grand Slam—a bonefish, tarpon and permit—and I feared Guidezilla (a pseudonym to protect the innocent) was going to blow my opportunity. Many online reviews said he was the best guide in the area—BUT potential clients should expect him to criticize their gear and fishing technique, and possibly even renege if a higher tipping client came along. Recalling his interrogation of me on the phone the night before over my ability to fish and tip him the required amount, I sat wrestling with my decision. Waiting and mulling, I thought I heard snickering from three fishermen descending the stairs on the heels of their more reputable guide. Guidezilla did show up 20-minutes later, passing me on his way to grab ice from the hotel’s restaurant. He motioned for me to load into an overcrowded little car teeming with a motley crew of local guides and a hungover British client. Introducing myself, I sardined my way into the metal container, grinning through the awkward-as-hell moment because my Grand Slam was now within reach. Thirty-minutes of bilingual chitchat on women, booze, and fishing later, we arrived at our destination where more crew members were readying their boats. Among them was another younger British client with a “WTF have I gotten myself into” expression that I too was surely repressing. Looking around the compound of simple blue shacks, I pondered whether to relieve myself in the bushes before my 8-hour confinement with Guidezilla. After consulting my bladder, I decided I would only cross that bridge (or rather jump in that water) when it became absolutely necessary. 1. I didn’t want him scaring me all day with his reputed machismo. 2. I usually fish with a husband that enables my incompetence. (i.e. I want to cast at all three Grand Slam species). 4. I didn’t want either one of us freaking out about limitations in my casting ability (it was my charter, I can “cast like a girl” if I want to). 5. If he did a good job, I would help ruin his bad reputation by writing a positive review online. My exuberant witnesses erupted in laughter, including Guidezilla, making jokes and diffusing any doubts about our looming compatibility on the water. A respectful yet whimsical rapport was now established and I was reassured my gamble on this guide was going to pay off. While underway, my ever-spirited captain cracked off a few hysterical comments about staying on his best behavior, laughing in approval when I gave him the finger for offering his large knife to subdue the ponytail I was struggling to pull through the back of my hat. Killing the engine to pole us closer to an edge that was exploding with tailing bonefish, I asked if we could rehearse our technique before getting into the school. I only ever wade or paddleboard for bonefish so am unaccustomed to fishing from a boat, especially when it involves casting over the head of a guide who is poling from the bow. He graciously accommodated a few practice casts as well as a slew of other requests I made throughout the day. Only on a few occasions did I have to remind him not to frantically repeat orders for how he wanted a particular cast or retrieval executed. Eventually he gave me time to adapt to his methodology, seeming genuinely relieved at not having to guide so intensely. Consequently, our day was spent enjoying productive fishing and amusing banter. Guidezilla’s expertise as a guide was never more apparent and appreciated than in his ability to match my agenda and casting ability with the character and condition of the fishery. In Turks and Caicos, big bonefish are an everyday prospect, so after catching only 3-5 pounders, I wanted to target permit. 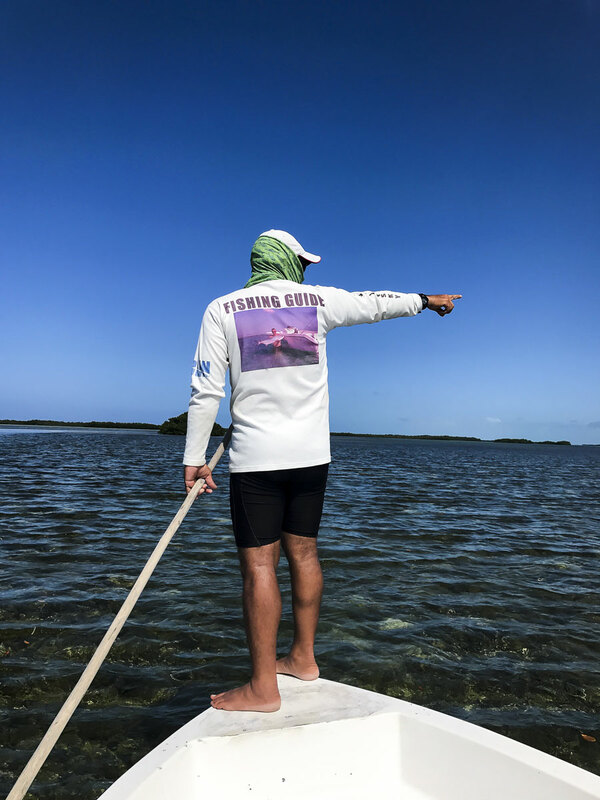 Instead of poling me in an area where I would have to cast fast and against the wind to spooky fish, he anchored us in a small channel between two flats where smaller permit consistently grazed in and out with the bonefish. This scenario would not necessarily have been every client’s preference, but it was exactly mine because the setting allowed me a lot of opportunities to cast at permit. Guidezilla patiently coached me on how to differentiate a permit’s flash from a bonefish’s when fishing deeper water, helping me to tweak my cast and fly presentation to a permit’s liking. Along with many smaller bonefish, I was able to hook two of the coveted Trachinotus falcatus and, for the first time, experience their unique pull against my rod. Unfortunately, my immediate reaction was to fight as aggressively as I do a bonefish, which only resulted in me breaking off both times. Such is the learning curve of targeting a new species. My shot at casting to a Grand Slam was complete when I threw my fly to a school of 60lb tarpon with another guide the next day. Though I didn’t hook up, I did turn one and get her to follow my fly all the way to the boat. Another first for me, since I’d only ever fished for tarpon on a spinning rod. I had met my goal of casting to all three species of the Caribbean Grand Slam and, by my standards, had an epic two days of guided fishing—not because my casting was epic, or the guiding epic, or because the fishery itself was epic (the new moon low tide definitely wasn’t great)—but because I had crossed a new personal milestone. A telltale grin bubbled across my smitten zinc-ed face. 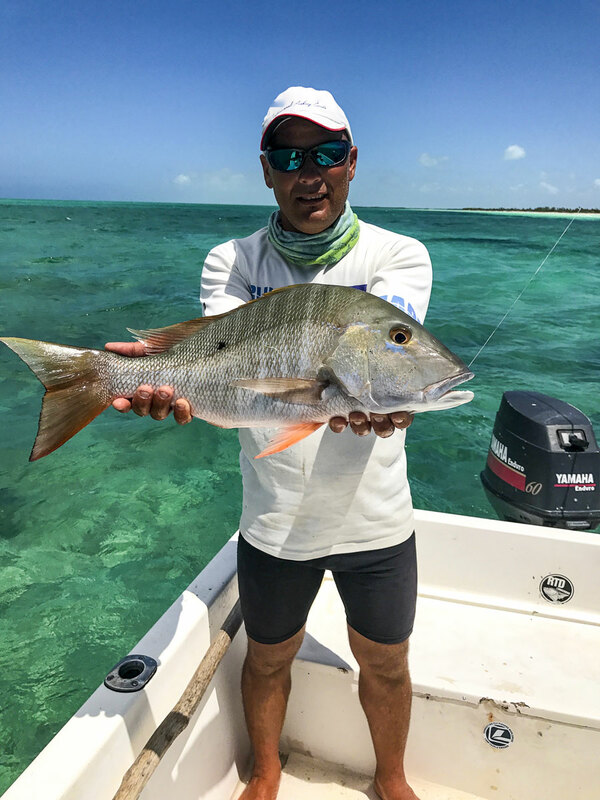 When hiring a guide solo, I cannot emphasize enough the need to overtly communicate your objectives and preferences to your guide, reiterating your agenda as often as is necessary to get the most from your charter. When asked to play nice, Guidezilla proved surprisingly tamable, and I suspect most guides would respond just as graciously. Taming your guide is as much about taming your own fears as it is about communicating your expectations. And, in case you’re wondering about that inevitable awkward moment feared by most women anglers, I never did need to jump overboard or ask to see a man about a dog on a nearby cay, despite having downed several liters of water in the boat that day. Guidezilla, on the other hand, had to relieve himself off the bow, warning me in advance not to turn around. When does that ever happen—the guy having to go and not the girl? 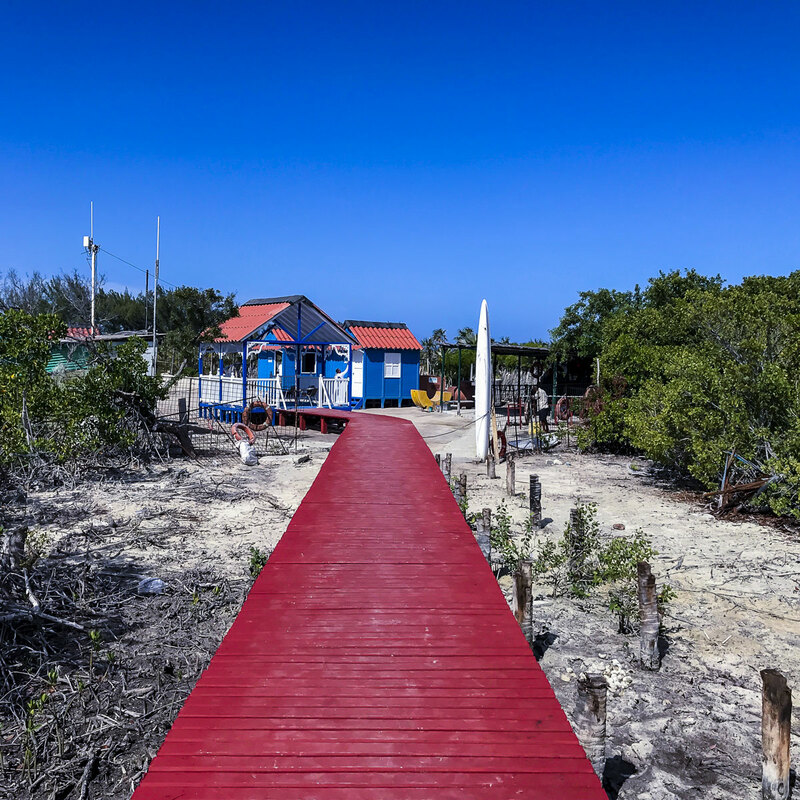 The most rewarding opportunities lurk beyond our comfort zone, so push through any misgivings and awkwardness when hiring an unfamiliar local guide. 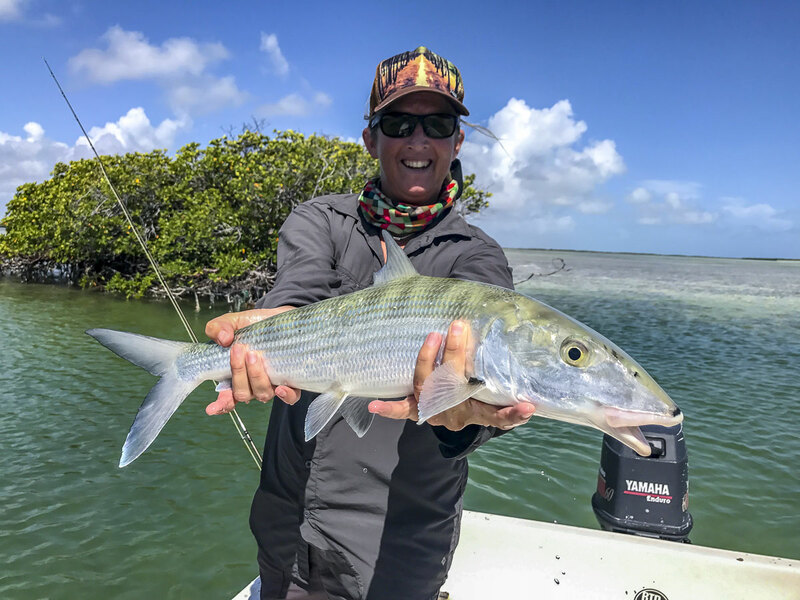 I fell into the adventure of a lifetime because the experience was as much about pushing myself as a solo female angler as it was about the potential for a Caribbean Grand Slam.